A lot of brides have the same questions. If you've thought of it, chances are someone else has asked it. But it doesn't mean that someone has answered it -- or answered it honestly. The question I get, more often than not, is: Who gets tipped at a wedding? It's confusing, I know. And a potential budget breaker too. You get quoted a price, pay it, and then have to find more money. Tipping in itself is a funny concept. You're tipping to say thank you for doing more than your job title expects and thank you for your exceptional service. So when I walk into a coffeeshop and order my coffee, then am asked to pick my drink up further down the counter, it seems very silly have the tip jar at the register. At that point, all that happened was someone rang me up. Am I being asked to tip her because she properly used a cash register? We do tip at the register and I think most people do. But the other day, the cashier actually took our change and put it directly into her tip jar instead of handing it to Pete. I'm pretty sure that's a form of robbery, and we did let her keep it, but, in all reality, instead of tipping her for doing such a great job at the register, we tipped her for doing some sort of thievery. But the question remains: Who gets tipped at a wedding? Who gets tipped at a wedding? Everyone you can afford to tip. That's the easiest way to narrow it down. If you are down to your last $100 and your options are tip the photographer or invite your Aunt Edna who called hours before the wedding to say surprise she can make it, pay for Aunt Edna's plate of food. But if you have a little extra money and your vendors did an outstanding job, tip them. If you can't afford to tip, don't tip. It's an extra, not a requirement. And if you decide that you can't afford to tip someone or they didn't do the job you expected, don't tip them. And don't feel bad about it. It's okay. And if you really want to tip someone, but you only have $5 left, tip them $5. That's fine. I created a list below with suggested amounts. It's not law and I'm basing them on my own opinions and experiences. I'm putting values because so many people have asked me to spell it out for them with values, but again: these are just suggestions. Feel free to disregard everything I say and do what you want. Or feel free to follow my list below exactly word for word. But who should you tip at a wedding? The rule someone told me once upon a time that I pass along to anyone who asks: Tip employees, not owners. If you hire a photo booth company and the owner of the company comes to man the booth all wedding, don't tip her. But if she sends her employee to run the booth, he gets a tip. The owner will set the price of what she feels her work is worth. And everything you pay is going in her pocket (except overhead costs). An employee, they're going to do a good job but the majority of what you're paying is going to the owner. Throwing the employee a couple extra bucks at the end of the night is nice of you (especially if he had to chase a drunk bridesmaid down to collect a few of the props she "borrowed"). Traditionally, you tip cash. You have an idea of who you're going to tip, so at the start of the day, give envelopes with cash in them and a vendor's name on them to someone in the bridal party. At the end of the night, find that person (for us, it was my dad) and ask them to pass out the envelopes. Some vendors, instead of a tip, will ask to be fed. If they're with you all day, like your photographers, you can't expect them not to eat. We fed all our vendors who were at the wedding (two photographers, two videographers, and six band members). We worked it out with our venue so that we only paid half price for vendor meals. We sat them all together at a table of ten and it worked out nicely for everyone. But if you've gotten to be friends with your photographer and know that she absolutely loves red wine, get her a bottle. Know that your videographer has young children who love animals? Get a family pass to the zoo. If you can be creative, go for it. If you're regifting the casserole dish you got at your shower, skip it. How do you know if tips are included? You have to ask that. It might be written on a contact that tips are included or appreciated. Ask if you don't see that. You might also see a service charge on your bill. That generally covers staff pay, incidentals, gas, supplies, etc. It does not include tip. And now, to answer who gets tipped at a wedding, I'm putting this in alphabetical order.Originally, it wasn't, but it was getting to feel a little disorganized. Should you tip the band/DJ? Our band was amazing. Absolutely amazing. Everyone had such a good time, plus they went above and beyond (they let Pete play a song with them). One of the singers (there were two) was the MC for the night, made sure everything stayed on time, and worked with me when I needed a few extra minutes before we cut the cake. We definitely tipped them in addition to feeding them. You expect the DJ or band to come and play music and that's that. But keep in mind that they have to get certain song requests before the wedding. they have to stop your drunk cousin from stealing the mic and making a mess of your wedding, and they have to keep the party going. They do a lot more than they're given credit for, so they deserve to be tipped (unless there's a disaster). By who? The bride and groom. How much? $25 per musician; $50 for a DJ (unless he is the company owner), plus a wedding meal. When? At the end of the night. Should you tip the bartenders? As a bride or groom, no; as a guest, absolutely. Most weddings have an open bar, which means the bar needs to be staffed with a bartender. Keep in mind: That's an extra cost for the bride and groom because, yes, the bartender is getting paid to be there. Even though the bar is free for guests, it doesn't mean that manners get forgotten. If you're a guest and get a drink, you should tip the bartender just like you would at any other bar. If you're the bride or groom, there is a very good chance you won't make it to the bar. You'll be stopped along the way so your best chance of getting a drink is when you ask your dad or brother to grab you one. Since you probably won't ever make it to the bar, you won't ever get to tip the bartender. But don't feel bad. All your guests will be tipping the bartender, so he'll do just fine. How much? $1 per drink. When? Whenever you get a drink. Should you tip the ceremony musicians? No. Our organist charged us $250. She met with me once to create the song list, then came to the rehearsal, and played our wedding. We didn't tip her anything extra. The soloist charged us $150 and all she was at was the 45 minute ceremony. I figured $150 was good enough for 45 minutes of work, so I didn't tip her either. Should you tip the florist? You know what, we didn't. But we also didn't get any of our reception site flowers at the reception. We paid for petals for the welcome table and a silver bucket for my wedding bouquet, plus a delivery fee. We never saw any of that. If it was delivered and the coordinator never set it up or if it was never delivered is still a mystery. You can send a thank you card after if you want. Should you tip the limo driver? By who? The bride and groom, if it's the bridal party limo. The guests, if it's a shuttle. How much? $20 per hour for the bridal party; $1 to ride the shuttle. When? At the end of the ride. Should you tip the photographer/videographer? At the end of the wedding, your photographer and videographer are only partially done with their jobs. They still have to edit, upload, and get you the final product. You don't tip halfway through something, you tip at the end. If you get the final photos and videos and love what they've done, send them a thank you card and a tip. And if you don't, that's okay. But if you tip at the end of the wedding night, that's too soon. How much? 3% or $100 (whichever is more), plus a wedding meal. When? After you get your photos/videos. Should you tip the priest? The church coordinator told me of a "suggested" gift for the priest, then a fee for the alter boy and liturgical assistant. At the rehearsal, the liturgical assistant came up to me to ask for the priest's gift. Apparently, it was a strong suggestion. That was his pay, though. He didn't get paid to do the ceremony, per say, but he did get that suggested gift. How much? Whatever you're told. When? At the rehearsal was our experience. Should you tip the seamstress? Fitting into your wedding dress is one of the most important things and your seamstress might have to work magic to get you into it. Plus, you'll have at least two meetings with her about your dress, so she is spending quite a bit of time with you. The price of your alterations usually doesn't reflect that (especially if you go to a small local shop). If you look like a princess and feel happy and secure in your dress, it's because of her. A tip is definitely welcome. How much? Nothing less than $25. When? At the final dress fitting. Should you tip the servers? Initially, I thought yes. I wanted to find out how many servers were going to be serving our guests and tip them. Pete's dad actually told me that the bride and groom don't worry about that. He said anyone who is old school knows to collect a few dollars from everyone sitting at the table and give that to the waiter. So, as a tip for guests: Carry an extra $5 in your purse and slip that to the waiter at the end of the night. How much? $5 per person. Should you tip the stylists? Yes. Tip the woman who waxes your eyebrows, the tech who does your manicure and pedicure, the makeup artist, and your hairstylist. If you look pretty on your wedding day, it's thanks to these people. If they make you look like a monster, don't tip. But if you look like a beautiful bride, a thank you is deserved. When? At the end of your service. Should you tip the wedding coordinator? So we thought our on-site coordinator would be with us all reception. Oh no. When my parents got there, my dad was introduced to the banquet manager. And when I saw our on-site coordinator, she informed me that she would be slipping out about halfway through and the banquet manager would be in charge. She also forgot to put up our lanterns, did not put our glass jars of sand at each table but rather put the dozen at the welcome table, and just a slew of other missteps along the way, We ended up not tipping her. I don't feel bad about it at all. She did her job, I guess, but she didn't do a complete job so I didn't think it was necessary to tip her. If yours does a good job, by all means, tip her something nice. That just wasn't our experience. How much? We would have given $250. Should you tip the valet? Yes. If there is someone who is parking your car and getting it for you at the end of the night, you should tip him. You should especially tip him if he helps you drive out of the woods or brings a golf cart to pick up your grandmother to bring her to the parking lot (both true things that happened to me). Your guests will pay, though; you don't have to add this to your budget. How much? $1 to $5. When? When you pick up your car at the end of the night. 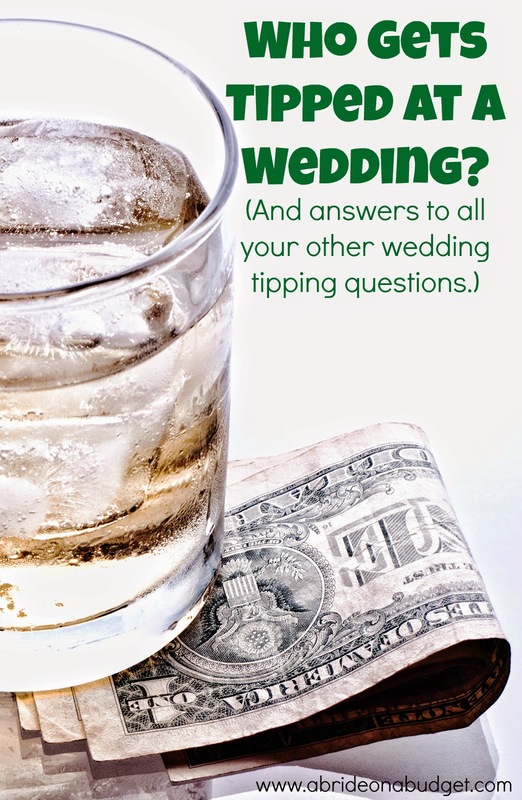 BRIDAL BABBLE: Did I miss anyone who might get tipped at a wedding? Great read and thanks for adding the When and By Who categories. That really helps! Such great advice and really great timing for my sister who is getting married in a couple of months. I especially liked the by whom and how much as it was extra helpful in clarifying. Great list! As a caterer in Minnesota, I am going to say that I have never, not once, seen guests at a wedding tip their service staff at the end of a meal :). 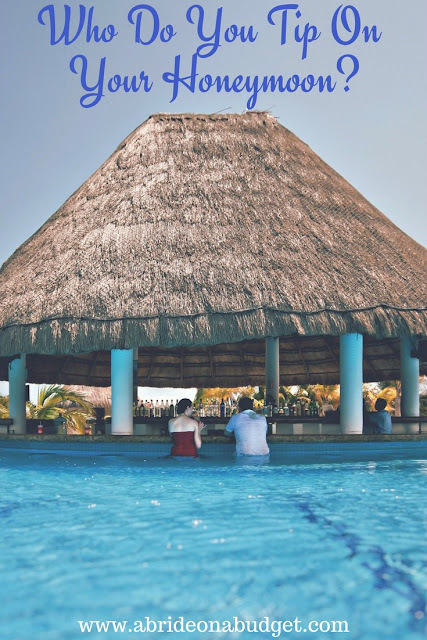 That may be customary in North Carolina, but in MN, I generally see the wedding couple offer a gratuity to the staff (the Banquet Captain or Banquet Manager) if they feel that they have received excellent service. Just my two cents. Actually, Julie, it's a customary thing up north. We're from New York, and it's always done up there. Actually, in Pennsylvania, it's not done very often. I've been to many weddings in this state, and that's not customary here. You're asking a lot of your guests already. Thank you for creating this list! My sister is getting married this summer, and while we don't have a lot of outside vendors, etc. there will be some, and this information will certainly come in handy! Thanks for clearing up what is often a mystery about tipping.